Many Oregon summits are made up of jumbles of loose, volcanic rock. Brown Mountain is no exception. In the summer, determined scramblers must leave the ease and comfort of the Pacific Crest Trail to make their way up piles of ankle-twisting boulders in order to stand on top of the mountain. But in winter, a blanket of snow covers the lava jumble, creating a smooth surface for backcountry skiing or snowshoeing. For experienced backcountry navigators, this adventure to Brown Mountain is a welcome breath of fresh air. Since there are so many different ways to get up to the summit, you'll likely find a route of your own. Bring a GPS to find the PCT and to leave a trail of waypoints so you can find your car when you return. From the Summit Sno-Park, a marked winter trail travels under a row of powerlines. At an unmarked junction, the PCT turns sharply left and leads to a road crossing. This may be the most dangerous part of the trip. Snowplows create high, steep, snowbanks on either side of the road that may be difficult to negotiate. Once across the road, you can follow the PCT as long as you'd like to get a good position to head for Brown Mountain. The terrain is softly undulating with pockets of coniferous forest and wide open lava fields. Watch for steam vents and hot rocks throughout the lava flows. Eventually the summit block becomes visible and the stands of trees become few and far between. Assess the avalanche risk carefully before proceeding up the last, steep stretch up to the summit. The summit plateau is broad, with several high points. 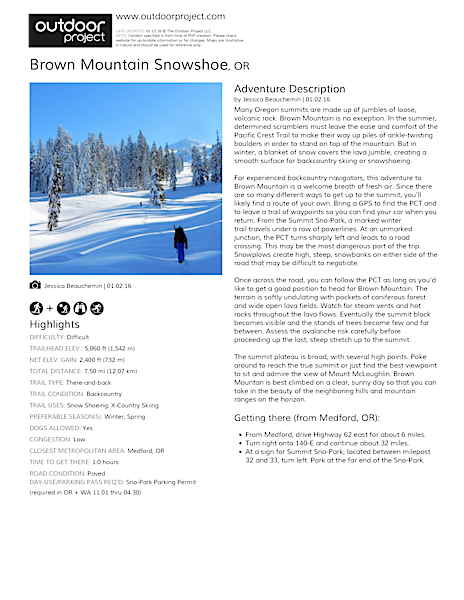 Poke around to reach the true summit or just find the best viewpoint to sit and admire the view of Mount McLoughlin. Brown Mountan is best climbed on a clear, sunny day so that you can take in the beauty of the neighboring hills and mountain ranges on the horizon. Solitude. Easy parking at Summit Sno-Park. Routefinding and snow conditions can be difficult.